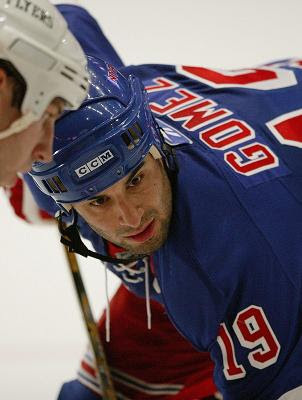 New acquisitions Scott Gomez and Chris Drury made their debuts as New York Rangers when the team was beaten 5-0 by the Philadelphia Flyers Saturday night. A rusty power play and some poor defense took the heat as Henrik Lundqvist allowed all five goals in his first game of the preseason. The first period started with a lot of action and special teams as seven different players on both teams were given penalties in the first 11 minutes. Not included in the penalties was Fedor Tyutin who pulled down Sami Kapanen for which he was awarded a penalty shot which was eventually denied by Lundqvist. There was no score in the game until shortly after the penalty shot Sami Kapanen was involved in another play. This time he beat two Ranger defensemen including Michal Rozsival to score on Lundvist glove side to put the Flyers up 1-0 12:15 into the game. From this point on it was pretty much all Philly and just a minute and a half later they scored again to make it 2-0. On the play Jagr made a bad pass right to Simon Gagne who took a shot on net when the puck was deflected by Mike Knuble for the goal. In the second period the Rangers attempted to get some scoring when Petr Prucha got a pass in front of the net and appeared to score, potentially making it 2-1, but after review it was clear that the puck merely hit the crossbar. New York had another chance soon after on a power play during which Gomez moved to the net with some fancy stick-work to make a smooth pass to Jagr who had a nice shot but was turned away by Martin Biron. About midway into the second, the Flyers started to put the game out of reach when Mike Richards scored to make it 3-0. During the play Prucha, Rozsival, and Marcel Hossa appeared to be standing still as Boyd Kane and David Laliberte had plenty of time to get the puck to the net until Richards scored on a rebound. 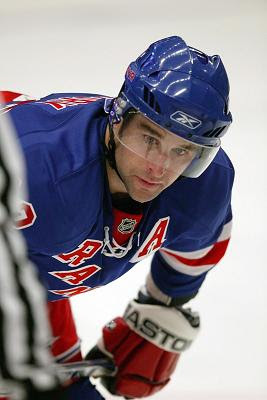 The only other time during the game the Rangers really threatened was during the third period after Scott Hartnell took a hooking penalty and the Jagr line went back to work. They moved the puck around pretty well and Jagr and Gomez both set each other up with Flyers goalie Antero Niittymaki off-balance only to both miss wide. The Flyers were able to score two more times during the third period. Steve Downie scored off a rebound and Mike Knuble picked up his second goal during a power-play by knocking the puck out of mid-air while Lundqvist was scrambling to get back after playing the puck behind the net. Throughout the game head coach Tom Renney was clearly trying different experiments while playing with seven different rookies in the lineup. One rookie in particular, Nigel Dawes, got a lot of attention playing left-wing alongside Jaromir Jagr and Scott Gomez during the power-plays. The line didn’t generate that many chances and the Rangers didn’t score during eight chances with a man advantage. Renney will continue to try different wingers to match up with Jagr and Gomez. Hossa has been given the most opportunities during training camp, but Martin Straka and Prucha will also be likely to get chances on the top-line. The rest of the rookies on the team played the same way Dawes did, not particularly impressive but with flashes of promise. One other standout rookie was Lauri Korpiskoski, a former first round draft-pick, who utilized his speed and size and beat Flyer Jason Smith before challenging Martin Biron in the second period.